Not much happens in this one horse town, unless you count the time bandits shot up a gold train just off the station. Or was it confederates shot up a troop train? I can never remember. Old Buck'd know. They say he was a gunfighter back in the day and still keeps a pair of pearl-handled pistols under the floorboards in his kitchen. Sheriff Watts don't believe that, though. He says guns don't carry to keepin' the peace, but that people should talk things out. I don't know about that, but I've seen Kitty the Saloon owner pass him a bag of silver dollars to keep her private business private. And things are pretty quiet at Sweeney's Hotel, but that don't signify. Sweeny's not around much. Spends most of his time visitin' his cousin's farm, he says. But I know he's got a shack just out of town full of shovels and a crate of dynamite. And there's something strange about Father Pat. He preaches OK, but there's a mean, distant look in his eye that some folks miss. I've seen him whispering with Miss Kitty in the graveyard when no one else is looking. Yeah, it's a quiet town, but I'm not sure how long it's going to stay that way. Just to put a bug in your ear...a lost bandit hideaway canyon...a ghostly Apache burial ground...a desolate Mexican border fort...a cattle ranch threatened from within and without. Dammit! Now I have a whole month's worth of ideas! Good stuff. Just one question, though. 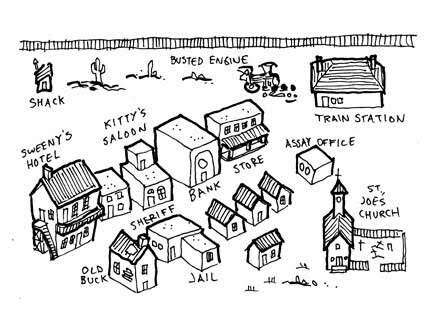 Who exactly has the horse in this one-horse town? Sheriff Watts? Sweeney? Ol' Buck? Or maybe the place is actually named "One Horse Town," and the horse it was named for died near on three years ago.